We had a press conference tonight before our practice. I was just expecting the same as last year, meet the boosters (old fella's who pay the bills) and the sponsors, mingle some, inhale lots of second hand smoke and old-man-beer-breath. Then, out of nowhere our teammanager starts talking in english, with all dutch people around, that only meant one thing, it was directed at me. 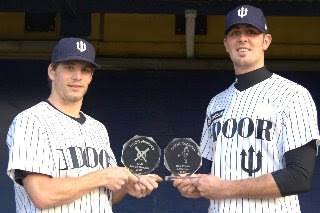 So he went on a bit about stats and passports and Netherlands team and whatnot, and then presented me with an award, Leon Boyd Best pitcher of Neptunus 2007 for my club, a very neat suprise, and totally unexpected. After me, my catcher got the MVP award of the team. He had an unbelievable breakout season, and was runner up for the league MVP award, and a truly genuinely awesome guy to boot. Nice everning with a good practice and nice bullpen after also.